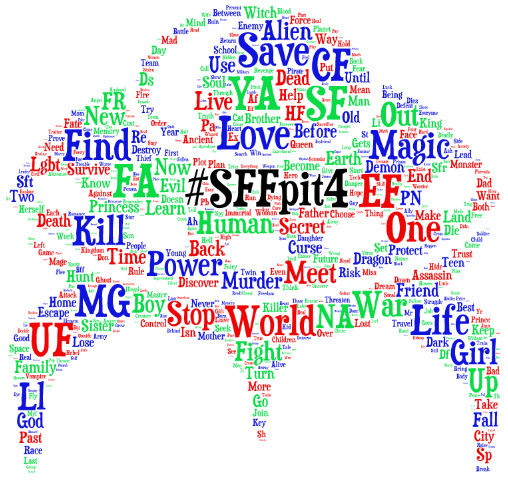 The fourth #SFFpit Twitter pitching event for sci-fi and fantasy authors was a doozy. It happened last Thursday, December 10th. For this event we’d followed the lead of Brenda Drake’s Pitmad, and altered the guidelines for pitching authors. Everyone got 10 tweets (total) to use as they would during the 10-hour window. And we asked participants not to retweet one another’s pitches. We didn’t do this on a whim, but at the request of agents and editors who felt the feed was overwhelming. I tip my hat to the participants, because virtually everyone followed the new rules. I can safely say after polling the participants and measuring the results that this was the right decision. More on that below. Here’s a quick run-down of the numbers most recent #SFFpit, and a comparison to the last one (in June). We had slightly more agents than last time, but about 100 fewer authors. I’m not sure why that is — maybe because it’s December, or authors are less enthusiastic about Twitter pitch parties — but it meant better odds for everyone who was pitching. 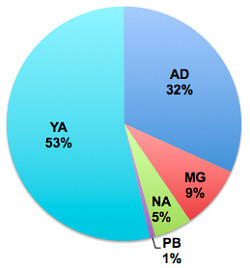 Young adult was the most popular age category, accounting for over half (53%) of pitches. Adult represented about a third (32%). Middle grade and new adult projects were in the minority, accounting for just 9% and 5%, respectively. Fantasy alone represented 32% of pitches, twice as much as sci-fi (16%). This, oddly enough, reflects my agent’s recent comments on her query inbox: she says she never gets enough sci-fi. Epic, urban, and contemporary fantasy were the most popular subgenres, each representing >5% of pitches. I was a bit bummed about the no-retweets policy, as were a number of authors. Retweets were a great way to show support for your fellow authors, to applaud a wonderfully-written pitch. At the same time, these pitching events have grown so much that many participants on both sides knew something had to change. 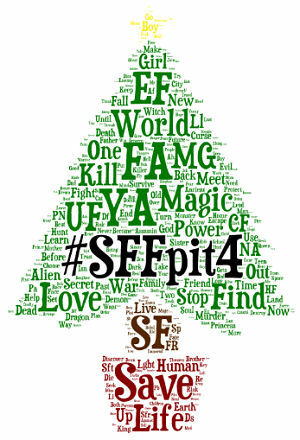 What do you think of the new #SFFpit rules? As you an see, the overwhelming majority of responders felt that the new rules were a good thing, or at least a necessary evil. But that’s just a matter of popular opinion. We also instead directly quantify the effect of the rule changes by examining the request rate of agents and editors. To assess how many participating authors saw requests, I kept tabs on about 15 agents and 3 small press editors whom I’d personally invited to #SFFpit. They liked pitches from 211 different authors (36.5%), which is an unprecedented success rate. Even if I exclude the two top requestors (an agent and a group of interns who together requested from 100+ authors), 149 authors (26.8%) got a request. Several agents/editors remarked favorably on the new pitching limits. #SFFpit still managed to trend on Twitter for about 7 hours. At least two particularly selective (trying not to say “picky”) agents who’ve come in the past but never made any requests, made some this time around. In my opinion, these observations offer compelling support for the new pitching guidelines. We all want to support one another, and I’ll do my best to think of a way to do that before the next event in June. But the pitch limits and no-retweet policy, for better or worse, nearly doubled the request rate by agents and editors. Speaking of which, I think it’s important to offer some guidance here on what to do if your tweeted pitch was favorited during this event. 1. Make sure that it was an actual request. Our tweets go out into the wide world of Twitter, and occasionally they’re seen/liked by people who just happen to be literary agents or editors. 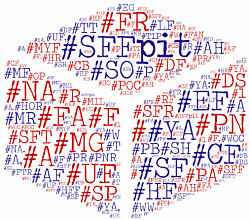 The ones who made requests clearly tweeted their submission guidelines using the #SFFpit hashtag. If your tweet was favorited by someone who’s not participating, or someone who’s not even an agent/editor, please take it as a compliment and nothing else. Don’t assume or complain. These people are not “breaking the rules” or trying to harm you. They’re just using Twitter as it was designed to be used. 2. Spend some time to research any requestor before submitting. Please, for the love of God, do your homework. There’s no real time limit for submitting, and you’re never obligated to submit at all. If it’s an agent, make sure they come from an established literary agency and are a good fit for your work. Maybe you’ve already queried an agent at that agency, or there’s someone else who might be better suited. You should especially get a little background on any small press editors who requested. I invited only about 5 small presses this time around, but easily three times that number showed up. Some of them, like Curiosity Quills, Momentum Books, Entangled, and World Weaver Press, are publishers I know and trust. Yet there are others I’ve never even heard of, and often these newcomers will make a lot of requests as a way to fill the query inbox. Maybe they’re legitimate, but maybe they’re not. Visit the publisher’s website to learn how long they’ve been in business, the experience of the team, and what types of books they publish. If the site looks fairly amateur, or you can’t find one, that’s a bad sign. Google the name of the press and look at entries that come up on sites like AbsoluteWrite and Preditors & Editors. Search for books published by the small press. Go to Amazon > Books > Advanced Search and put in the publisher’s name. An established, bona fide publishing operation will have books out by multiple authors with favorable reviews. Ask around. Publishing is a smaller world than you think, and odds are that your writer friends will have some intel. Feel free to shoot me an e-mail if you’d like my opinion of someone. It won’t take nearly as long to do this research as it took you to write your book. Please hit the pause button and make sure you know what you’re gettin ginto. 3. Make sure it’s the right path for you. On a related note, before you respond to a request, please make sure it’s what you really want to do with your book. Publishing with a small press is different from seeking traditional literary representation, and in general you shouldn’t pursue both for the same book. There are differences among literary agents, too. We saw the full spectrum last week, from new agents actively building a list to top sellers who might only sign one client this year. You’ll have to weigh these considerations and decide what’s best for your and your manuscript. Based on the feedback and results, I think we’ll keep these new rules (or something similar) for the next #SFFpit, which should be in June 2016. Thank you to everyone who supported this event! It wouldn’t be possible without the agents, editors, authors, and cheerleaders who show up to make it happen. Thanks for putting so much hard work into #SFFPit, Dan. It’s much appreciated. Dan, thanks so much for hosting and putting together these amazing stats! I had a great experience pitching on the hashtag.